This light-hearted sitcom revolves around Ann Marie (Marlo Thomas), an aspiring and frequently unemployed actress. Ann moved from her small hometown of Brewster, New York to make it in the Big Apple. While she waits for her next acting part to come along, she takes different offbeat temporary jobs and frequently gets herself into a lot of jams. Though they support their daughter, Ann’s conservative parents, Lou and Helen Marie (Lew Parker and Rosemary DeCamp), are nevertheless concerned about her lifestyle and aspirations. Ann’s boyfriend is Donald Hollinger (Ted Bessell), a writer for Newsview Magazine. He’s an understanding guy who’s always on hand to help Ann get out of her predicaments and frequently finds himself getting pulled into them. Ann and Donald’s friends are Jerry Bauman (Bernie Koppell) and Margie “Pete” Peterson (Carol Ann Daniels, then Ruth Buzzi). Each episode opens with a strange incident or a discussion that foreshadows the story. The scene ends with someone exclaiming “…that girl!” and pointing to Ann. The camera freezes on her and the show’s title appears as the theme song begins. 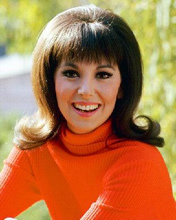 Partially a clip show, and partially a reaffirmation of Marlo Thomas’ feminist views, Donald wrote an article on the 1970’s women’s liberation movement, which Ann found offensive and tore out and put in a sandwich for him in order to make him “eat his words.” After reading the article aloud to her, he’s shocked to find the girl he has wanted to marry since 1966 is one of the very women he wrote about. Ann explains how contemporary feminism benefits not only their relationship, but relationships in general, and society at large. Along the way, she persuades him into going to one of her women’s lib meetings even though he wants to go to a New York Rangers game, while holding ten tickets reserved for his friends and co-workers. Unfortunately both get stuck in an elevator with another young couple and the elevator operator, and she continues to lecture him on feminism. Some of the incidents Ann claims are examples of male chauvinism though are debatable. The most notable is from “A Muggy Day in Central Park,” which is actually an example of poverty, greed, and sociopathology, rather than men and their desire to overpower women. Once the elevator is fixed, Ann and Donald run into one of her fellow women’s libbers and found out the meeting was called off because none of the men who were invited showed up. First aired: March 19, 1971. Despite the fact that much of the fifth season centered around the impending wedding between Ann and Donald, Thomas wanted to make sure the series didn’t end with a wedding, fearing that it might give young women the impression that marrying a man is mandatory. This left a great deal of speculation among fans of the show that the two main characters may have never got married themselves. What do you think? Do you like the the That Girl TV show? Would you liked to have seen a reunion? Series in its entirety can be seen on Hulu t.v. – well worth the indulgence! Does anyone know where I can find and watch the That Girl series finale that played march 19, 1971? You need chapters for the series finale and other details. I can submit them if you wish. I’m not sure what you mean by chapters. Oh, you’d like to write a description of the final episode? That’d be great. Please send it using the contact form and I’ll take a look. Thanks! I always loved Carol Ann Daniels in this series. Wish she had done more in television after That Girl.